Home / Election 2019 / Watch video: Why Surf Excel ad faces controversy on twitter? With the theme "Rang Laaye Sang" or colours that bring us together, the one-minute ad shows a young girl dressed in white goading children to splash her with Holi colours until they run out. When the children have no more colours left, the girl motions an all-clear to her Muslim friend, dressed in a crisp white kurta, and takes him to the mosque for prayers. "Later it's your turn to get sprayed with colours," she tells him. Then comes the famous tagline - "Daag acche hain" (stains are good, especially for a good cause). Detergent brand Surf Excel, known for its heart-warming ads, was caught in a Twitter flap over its latest campaign, revolving around the Holi festival and Hindu-Muslim friendship. The Hindustan Unilever brand was trolled with the hashtag #BoycottSurfExcel by what appears to be a section of hardliners. Many have praised the ad, released on February 27, for its message of religious harmony. The video has already gathered around 7,740,000 views on YouTube. #boycottSurfexcel because you also know that the add is humiliating Hinduism. And promoting love jihad. Gender selection and talking holi colour as "daag" is not acceptable by Hindu because it is done intentionally. Gender selection could have been reverse also. "Dear Sir, please ban the advertisement of Surf Excel which promotes love jihad." The Twitter user added that it is hurting the religious sentiments of the Hindus. the advertisement humiliates Muslims and wrote, "#SurfExcel ad is humiliating Muslim girls to the core. it is directly saying that a Muslim male child needs the help of a Hindu girl for doing his prayer. This is shaming and humiliating all Muslim children." 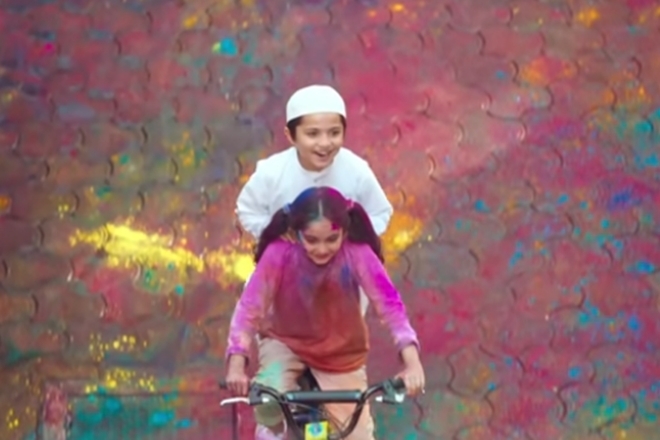 While many raised objections over the theme, there were also many who have appreciated the Surf Excel Holi advertisement on the Hindu-Muslim harmony and the idea and message behind it. Congress leader Sanjay Nirupam said, "He who objects this ad by Surf Excel is nothing but against the idea of India. Hats-off who created this beautiful film. #JaiHind." Former Jammu and Kashmir Chief Minister Mehbooba Mufti also welcomed the advertisement promoting Hindu-Muslim harmony and slammed the "bhakts" for objecting to its theme. She said, "I have a better suggestion. Bhakts should be washed properly with Surf Excel. Kyunki Surf ki dhulai daag ko karain saaf."